Why the need for this post you might ask? 90% of the travertine floors I have looked at recently have had the wrong sealer applied to them. Granted most of the time it was a tile installer or builder just trying to cover up or mask the ‘dirty’ look that the tiles came out of the box – but I digress…. Yes a lot of times the sheen of the desired floor is very much different than the tiles that were picked out at the tile store. I’m sure the salesman told the homeowner that “this sealer will fix it” or something along those lines. The song certainly remains the same I am afraid. Most honed travertine out of the box will appear dirty, add to that fact sometimes grout haze is left behind and you have the recipe for immediate action to bring the floor back and the resulting trip to the hardware supply store. Well congratulations you have just given yourself a supermarket floor without even knowing! The only difference is that they (the super market) has a staff that will maintain that sealer/wax every evening and get out the scratches and scuff marks. All that you know when you show up the next day is that their floor looks pretty good. Well it should! Now back to your travertine floor – how does it look? Starting to show heel marks, traffic patterns or scratches? I bet it is. Well what to do? 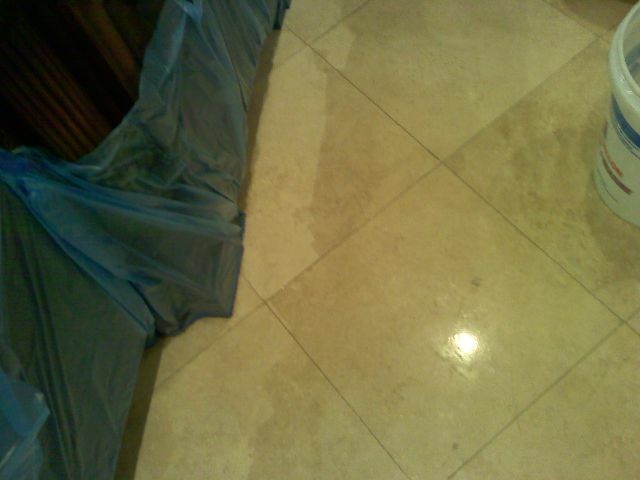 The first step is to strip off that improper sealer and see the condition of the floor you are dealing with. What is the proper sealer by the way? An impregnating sealer is the only sealer that will let your travertine actually look and feel like travertine is supposed to. This photo (left) is a picture after we have stripped the edges of the floor next to the cabinetry. Notice how yellow the middle area is? The sealer has darkened substantially because it is UV sensitive. Sunlight will gradually change the color of many topical sealers. Something to look forward to eh? Am I applying this sealer to change the appearance of my travertine? Do I want the floor nice and shiny? Do I ‘need’ a layer of protection? Color enhancing, polish, satin, gloss, sheen. Any of these words let you know that it is more than likely a topical sealer that you have grabbed. Replace it with one that has only the words “impregnating sealer”. « Thank You to our Commercial Clients!